Click here to share this image. The sea urchin is a predatory animal related to starfish, sand dollars, and sea cucumbers. Its spines are articulated on joints, so that they can be pointed in any direction. The sea urchin moves by siphoning water through the hole on top of its dome-shaped shell and pumping the water through its tube feet, which have suction disks at the ends. These tentacle-like feet protrude in the five evenly-spaced, lighter-colored bands on the surface of the shell. They serve the urchin as legs, feet, grasping “hands”, and sensory organs. 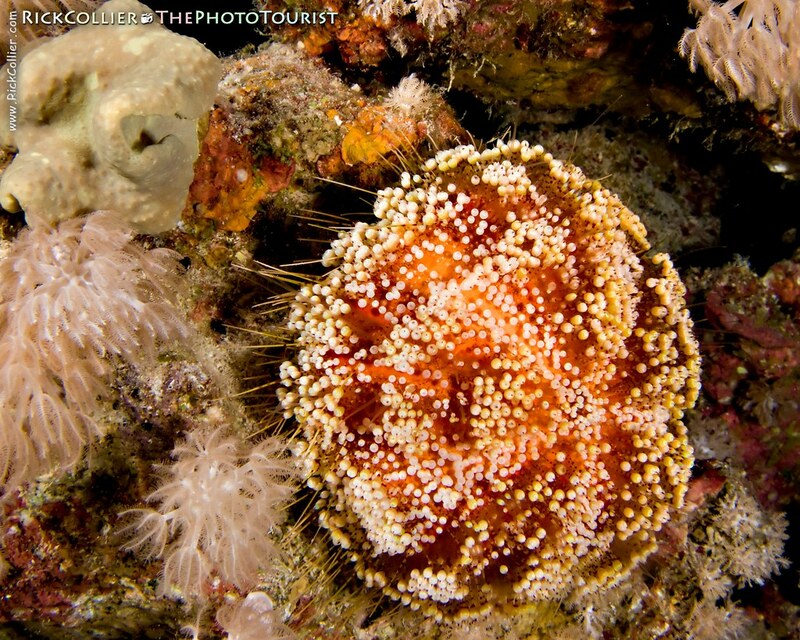 Like many reef animals, urchins tend to be more mobile and hunt the reef at night. I came across this one moving quite actively across the reef during a night dive at the “Paradise” dive site in Sharm el-Sheikh. From this shot, it is easy to see that the urchin is moving on extended tubular “feet” to explore its surroundings and move around the reef. This entry was posted on Monday, October 26th, 2009 at 18:25 PM. It is filed under thePhotoTourist, Underwater and tagged with coral, dive, Egypt, Paradise, pin cushion sea urchin, pincushion, pincushion urchin, Red Sea, reef, scuba, sea urchin, Sharm, Sharm el-Sheikh, Underwater, urchin. You can follow any responses to this entry through the RSS 2.0 feed.